Q. How do I request an item in WorldCat? 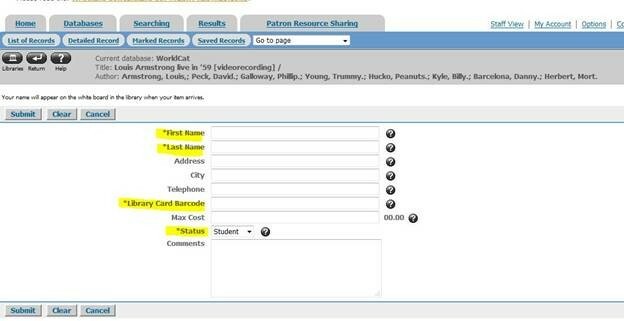 You can use WorldCat to request items from other libraries like I-Share and the library catalog. Unlike I-Share, WorldCat items come from public libraries with shorter loan periods. Items sometimes take a week or more to arrive at HCC Library! 1. After finding the item you want, click on the title in the results list (as highlighted below). This will take you to the detailed record page. 2. Next, click on the ‘Borrow this item from another library’ link. This will take you to a page where you can fill out your information. 3. Fill out your name, library barcode (on the back of your HCC ID) and status (staff, student, etc.) then click submit. That's it! You will get an email sent to your Heartland account when the item is in.